US taxpayers will give Israel a total of $38 billion of weapons over ten years ($3.8 billion each year from 2019 to 2028), according to a 2016 agreement between the two countries. Israel uses these weapons, in violation of US laws, to commit human rights abuses against Palestinians living under its brutal, more than half-century-long military occupation of the West Bank, including East Jerusalem, and the Gaza Strip. These include injuring and killing civilians, detaining and abusing children, demolishing homes, uprooting Palestinian crops, and denying freedom of movement and expression. The $3.8 billion dollars in weapons we provide to Israel annually could be used instead to fund urgent needs in our communities. 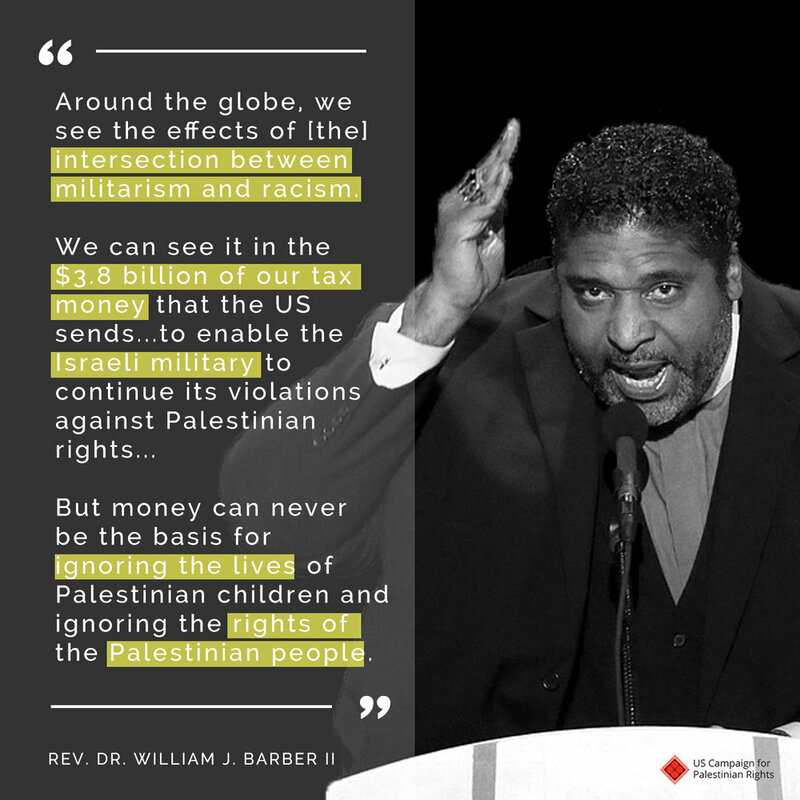 Pass a resolution calling on the US government to end military aid to Israel and redirect that money to unmet community needs. While world leaders like Trump and Netanyahu invest in endless war and militarism in the name of “safety”, justice activists of all stripes are calling to create safer communities by divesting from war and investing in community needs. For groups at the vanguard of the progressive movement, this push has included calls to end military aid to Israel. Find more information about how much military aid your state, county, and city sends to Israel at militaryaidtoisrael.org.